If “cabin in Arkansas” brings to mind small log cabins with no plumbing, lanterns and creepy, crawly insects in your sleeping bag, then think again. Sure, there are cabins, cottages, and lodges that are more rustic than others. But we can hardly call a cabin “rustic” if it has a Jacuzzi on its private patio, cable TV in its living room and bedrooms or poolside cabanas, gourmet restaurants and an award-winning marina steps away from the front door. Heck, that’s practically a step above luxurious! So whether you prefer to depend on camping-style survival skills or will only survive with hotel-style amenities, Arkansas is the place visit. Discover your outdoor vacation at Heath Valley Cabins in Mena, Arkansas. 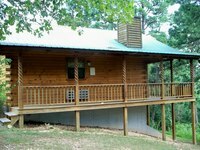 Each cabin from Heath Valley Cabins offers you a unique lodging choice in the Ouachita Mountains of Arkansas. Choose from six distinctive cabins offering all the modern luxuries you want on your vacation: satellite television, a fully equipped kitchen, and much more! And, whether you're looking for a great snowmobiling vacation or arrive in summer for ATVing, fishing, hiking, and more, there is year-round fun waiting for you at Heath Valley Cabins. Hike through the beautiful Ouachita National Forest, canoe or kayak down a nearby river, or just relax in your cabin. The choice is yours! Enjoy rustic charm and the ultimate in privacy at The White River Inn! The White River Inn offers five charming mission-style suites in a stunning lodge overlooking the White River. The lodge's wood construction and rustic decor bring the natural beauty of the Arkansas woods inside. More than just a charming location, The White River Inn offers a wide variety of great activities. The lodge offers a world-class destination for fly fishing enthusiasts, sporting fanatics, and history enthusiasts. Whether you're taking a guided fishing trip with the lodge or exploring the surrounding area, your trip is sure to be memorable. While you're in Cotter, visit the gorgeous Rainbow Bridge. This 1930 bridge is listed on the National Register of Historic Places. Enjoy a fishing trip with The White River Inn. All your meals, snacks, soft drinks and mixers are provided, and your guide will bring you to where the fish are biting. All you have to worry about is casting your line! Whether you’re planning a romantic honeymoon or a family vacation, Beaver Lakefront Cabins in Eureka Springs, Arkansas has a perfect accommodation for you. 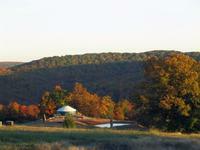 Beaver Lakefront Cabins are located on the shores of Beaver Lake and within easy driving distance of Eureka Springs. Every cabin and suite has a front glass wall and a large covered deck, so you will always have easy access to your stunning lakefront view. The cabins also feature a large two person jacuzzi facing the lake, a native stone gas fireplace, and a fully-equipped kitchen. Fishing enthusiasts will be impressed by their indoor heated fishing room, the only one on the lake. They also offer free kayak, canoe, and pedal boat rentals for those who want to explore the nearby coves. Book your cabin now and experience an unforgettable Arkansas vacation. The area also offers a variety of outdoor adventures including zip lining, horseback riding, caving at War Eagle Caverns, touring Beaver Lake on the Belle of the Ozarks, scuba diving near the Beaver Dam, hiking at Lake Leatherwood, and of course, the stunning White River is renowned for its trout fishing and recreational canoeing. For a more relaxing experience not to mention a potential surprise for that special someone, their in-room massage and private dining services are a popular option. There's no need to leave the comfort of your cabin or suite when you can just let the masseuses or the chef come to you. At #6 is Gaston's White River Resort, a fantastic place for an Arkansas vacation! What better way to explore the Ozarks than with a stay in quaint and comfortable cabins, close to all the action and scenic beauty the area has to offer! Whether you want to go fishing, or just explore the area, Gaston's White River Resort puts you right in the middle of it all! With over 400 acres and two miles of river frontage and an airstrip offering easy access to the resort, it combines both accessibility and luxury with backwoods charm. Try your hand at trout fishing on the river, or visit the onsite restaurant. Two nature trails wind through the 400 acres and offer a beautiful woodland escape to tranquility and peacefulness. At Gaston's White River Resort there's no shortage of southern charm and they'll be as happy to meet and take care of you, as you are to be there! A hike through the Ozarks is not to be missed. The historical and culture significance to the area is waiting to be discovered! Try one of the fishing boats available onsite, get out the river and explore! Or maybe just work on your fishing skills! Nestled on rock ledges and 450 feet above the White River, a stay in an Arkansas White River Cabin is one that, on paper, sounds intimidating. But when you arrive, you'll see that nothing could be further from the truth. Cabins overlook a peaceful valley and feature pristine views of the distant mountains. Cains are rustic, spacious, and exceedingly comfortable. They're the perfect place to rest, party, or set off from to enjoy historic Eureka Springs' multitude of Victorian homes and quaint shops. Meanwhile, you'll love swimming, boating, canoeing, fishing and most forms of water adventure on the 28,000 acre Beaver Lake and Dam, all just minutes away from your grand accommodations. Finally, if Branson or Silver Dollar City is on your itinerary, it's only about a 90 minute drive from your cabin. The world is at your fingertips- go experience it, or just relax in your sublime White River Cabin! The Arkansas White River Cabins are easily accessible on a fully paved road 1/2 mile off US Highway 62 West. Sorry, no pets or children under 14 years are permitted. Your only place to find an out-of-this-world fishing experience is at River Ridge Inn! Relax in luxurious comfort during you next fishing trip to Arkansas when you stay at the River Ridge Inn! Whether you choose from one of the cottages, chalets or individual lodge guest rooms, you'll be surrounded with impressive amenities like air conditioning, satellite television and access to the onsite fitness center. However, these accommodations are not the only thing that will draw you to this area. River Ridge boasts a number of experienced fishing guides, sure to make your fishing trip a successful one. Whether you prefer spin casting, or fly fishing, the friendly staff will help you navigate the North Fork of the White River. Record sized brown and brook trout have been taken pulled out of these bountiful waters, so make sure your name is the next one to grace the area record books. Wildlife is abundant along the banks of the river. Don't be surprised if you encounter eagles, deer, elk, beavers or even black bears. Make sure to bring your camera along so that you can capture memories of your amazing outdoor adventure. River Ridge Inn offers the only Fly Fishing Academy on the North Fork of the White River. Here, you'll learn the basics of tying your own flies, hone the skills necessary to be a successful fly fisherman and then you'll head out on the waters with a guide to ensure your first experience is a positive one! Make your vacation escape to the Ozark Mountains with Can-U-Canoe Riverview Cabins. The eight Eureka Springs cabins from Can-U-Canoe are located deep in the Ozark Mountains on a bluff, overlooking the Arkansas White River and Inspiration Valley. These rustic log cabins offer privacy and all the space you need, whether you're looking for an intimate one-bedroom escape or a spacious five-bedroom lodge for a group event. Enjoy the quiet of the woods and a beautiful natural view. More than just escaping, you'll find a wealth of outdoor activities near your private cabin. Hiking, mountain biking, kayaking, fishing, swimming, canoeing, and more are all just a few minutes away. If you're looking for something a bit less rustic, the Opera of the Ozarks, Country Music Shows, The Great Passion Play and many other attractions are also nearby. With the Arkansas White River, it's easy to head out for a day of fly-fishing for trout. Not an experienced angler? Don't worry! There are many guides who can take you right to where the fish are biting. The managers at Can-U-Canoe were honored as the Arkansas Hospitality Association's "2011 Honoree Managers of the Year." If you're looking for a completely alternative take on cabin rentals look no further than Lookout Cottages in Eureka Springs. Lookout Cottages offers a luxurious hideaway for travelers looking for a historic slice of paradise. Here you will arrive through stately wrought-iron gates that open up to a four-acre turn-of-the-century estate, transporting you back-in-time to a truly unique vacation experience. Lookout's collection of beautiful cottages range in size and style making it easy to find the vacation home that's just right for you. Enjoy beautiful, modern decor and furnishings, including full kitchens, spacious living rooms and private decks with naturally wooded views. There's no place better to relax and indulge than this! The colonial-style Manor House was built in 1902 and the cozy cottages around the house all rest atop a beautiful mountain in Crescent Park, so you're not only guaranteed a luxurious stay but breathtaking views every moment of your stay. Lookout Cottages prides itself on offering seven ways to relax. All seven unique cottages vary in size and style, but each one is guaranteed to wow you! Each guest receive a special resort pass for the Historic Crescent Hotel amenities that includes free shuttle, downtown parking, swimming pool, game rooms and daily activities. While you're staying at Lookout, enjoy a therapeutic massage in the New Moon Spa, brave the ghost tour, and enjoy fine dining in the lovely Crystal Dining Room. Resting on 136 acres in a secluded glen within the beautiful Arkansas Ozarks is an unforgettable retreat that's ideal for families, couples and friends alike. Azalea Falls Lodge features a lodge and bed and breakfast, each with a selection of charming rooms. You'll find three unique accommodation options perfect for larger group getaways and family vacations when you plan your next Arkansas adventure at Azalea Falls Lodge. 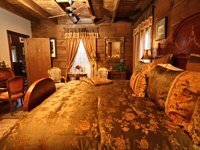 Choose from the lodge itself, the Azalea Falls Cabin, or the Beauty Lodge B&B, each of which features many unique amenities sure to keep you comfortable throughout your stay. Amenities include beautiful private decks and patios, fully-equipped kitchens, Jacuzzi tubs, and wireless internet access. Start planning your getaway today! Explore the many mountain trails, spend a day canoeing down the Buffalo River, or teach the kids how to fish. There's so much to do, you won't ever want to leave! Stay at their cozy cabin, a spacious 1,700 square foot log-style home with full kitchen, private balcony, Jacuzzi tub, and large deck with barbecue grill. Providing guided hunting, fishing, canoeing, and horseback riding trips on the Buffalo National River, Buffalo River Outfitters is Arkansas's premier outfitting company! The resort offers everything from canoes and kayaks to horses and shuttle services so you won't have to worry about a thing. The Buffalo River is the best backdrop for your next Arkansas family getaway, and Buffalo River Outfitters has the perfect accommodations for you! Their log cabins accommodate from two to ten people. Indulge in fully equipped kitchen, air conditioning, and stone fireplaces. All cabins have hardwood floors and handcrafted accents. Relax in your private jacuzzi tub and reconnect with nature! Whether you are interested in canoeing, kayaking, tubing, or rafting they have what you need. Take the kids on their first horseback ride, or hike through the surrounding trails. After a day of adventure you will be glad you have a comfortable abode to relax in. Guided tours by boat, foot or horse are available as you interact with nature. Located in beautiful Eureka Springs, Arkansas, Lake Forest Luxury Log Cabins is the perfect place for your next getaway to the lake. 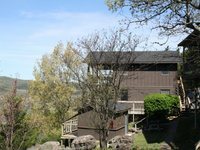 Lake Forest’s distinctive cabin rentals are located between Beaver Lake and the Ozark Mountains. The cabins were made for any situation and can accommodate anything from large families of ten to romantic getaways for two. Amenities in the rentals include a fully-equipped kitchen, air conditioning and heat, and a two-person jacuzzi tub. Worrying about all the supplies you’ll need? Don’t fret, Lake Forest provides linens, toiletries, trash bags, and more. All Beaver Lake cabins are conveniently located near all the finest recreation the area has to offer, including breathtaking horseback riding trails in the Ozark Mountains, boat rentals, fishing guides, and much more. If you are having a romantic getaway in one of Lake Forest's luxury cabins, consider having dinner or brunch made for you. The chef will come to your cabin, set the table, cook your meal, and present each course. If you want to branch out from your cabin and go do some fun activities, there are plenty to choose from. Take a scenic horseback ride in the Ozark mountain countryside, hike the Eureka Springs Trails, or marvel at the masterpieces in the Crystal Bridges Museum of American Art. If you're coming from Eureka Springs, take Highway 62 west to 187 South and turn left (Riverlake Outdoor Center). Then go four miles and take the left fork in the road (lots of signs in the fork) onto Mundell Road. Go 1 mile. Take a left onto Lake Forest Dr. They are located on the left hand side of the road. First driveway on your left. If you're coming from Highway 71 at Bentonville, take exit 86 onto 62 east and go 27 miles. Go one mile past 187 north and turn right onto 187 south. Go five miles on 187 and watch very carefully for Mundell Road. Take a hard switchback right onto Mundell Road. Go one mile down and turn left onto Lake Forest Dr. They are located on the left hand side of the road. First driveway on your left. 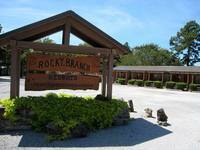 For a vacation that lets you relax as much as play, there's no better choice than Rocky Branch Resort. Located in the heart of the beautiful Ozark Mountains of Arkansas, this Beaver Lake retreat lets you experience all the comforts of home while being minutes from exceptional activities. When you need a break from the water, hit the many surrounding trails that offer stunning views of the lake and mountain terrain. The Ozark Highland Trail is a popular choice and ranks as one of the top ten trails in the United States! After a long day of adventure, return to your comfortable accommodation that features amenities such as full kitchens, fireplaces, large flat-screen television, and more! Beautiful Beaver Lake offers excellent outdoor adventures for travelers of all ages. The 28,370-acre lake offers miles of shoreline where you can lounge and soak up the sun, or dive into the waves for a refreshing swim. Nestled in the Scenic Ouachita Mountains of Arkansas, Panther Valley Ranch is an authentic 100-year-old Western horse ranch offering scenic lodging described as rustic elegance. Enjoy mountains, creeks, and woods that surround Panther Valley Ranch’s relaxing scenic lodging. Being surrounded in natural beauty does not mean you’ll be roughing it, their suites come with wireless internet, Jacuzzi's, air conditioning, and more. The ranch is only five miles from downtown Hot Springs National Park but it is still far removed enough that you feel you have left the world behind. Bask in the views on a hiking trip through the park or head to the nearby shooting range and line up your sights with a round of clay shooting. Come to Panther Valley Ranch and let your stress melt away. Relax at one of the day spas in the area, take the kids to the Magic Springs Amusement Park, or do some trail riding in the Off Road Vehicle Park. The Hot Springs National Park calls itself the “oldest area in the national park system” because in 1832, 40 years before Yellowstone became the first national park, President Andrew Jackson set aside the hot springs as a special reservation. The federal land became a national park in 1921. “Live the Legend” at the 1886 Crescent Hotel, Spa and Cottages. What legend, you say? Well, as a member of the Historic Hotels of America and with a reputation of being America’s most haunted resort hotel, it’s had more than a century to build a vibrant (and sometimes spooky!) past. Be a part of it! Within the Ozarks high above the Victorian town of Eureka Springs, the hotel has been a symbol of elegance and prestige for decades. More than 130 guest rooms, suites and penthouses have been remodeled or refurbished and feature stately décor and luxurious amenities. The newest additions to the hotel, however, are the 38 cottages in Crescent Park, set back on the grounds’ west end in a secluded forest area. The two-bedroom, two-bathroom cottages are split up into varying floor plans with names that reflect the surroundings, like Sassafras, Sycamore, Tulip Tree and River Birch. Hardwood floors, balconies and fireplaces only enhance the spacious cottages. Cottage owners and vacationers have the same privileges as hotel guests, including housekeeping, bell and concierge services, security and hotel amenities. And don’t forget to get acquainted with Crescent Hotel’s oldest residents during a Eureka Springs Ghost Tours walk. The 1886 Crescent Hotel, Spa and Cottages is located in Eureka Springs on the Historic Loop – Old Highway 62B, 75 Prospect Avenue. The Crescent Hotel’s lower-level series of rooms are said to be one of the most actively haunted areas in the building. New Moon Spa and Salon, Dr. Baker’s Lounge, Crystal Dining Room, Rooftop Billiards and hotel tours. Discover your outdoor adventure at Mountain Harbor Resort and Spa in Mount Ida, Arkansas. If you're looking for comfortable cabins and plenty of fun, you will find it at Mountain Harbor Resort & Spa. Mountain Harbor offers a variety of lodging options, ranging from rustic Arkansas lake cabins to cozy condos. No matter what you choose, you'll find privacy and a wide variety of outdoor activities. Mountain Harbor is one of the top Arkansas lake resorts when it comes to outdoor fun. Boating and waterskiing or swimming are great ways to explore the lake. 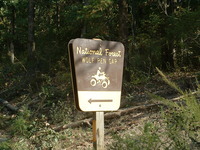 Hikes through the Ouachita National Forest are a great way to explore the natural beauty of the area. All this and more awaits you at mountain Harbor! To get to Mountain Harbor Resort from Little Rock, take I-40 to I-30 South. Travel approximately 40 miles on I-30 and take Hwy 270 West toward Hot Springs. Take the Hwy 270 Martin Luther King Expwy around Hot Springs and keep heading west on Hwy 270 toward Mount Ida. Travel approximately 25 miles and watch for the Mountain Harbor Resort sign at the Valero Station just past the township of Joplin. Turn right at the sign onto Mountain Harbor Road and travel approximately 2 miles. Need a moment to relax? Turtle Cove Spa offers Lake Ouachita’s only lakeside spa experience and is the perfect way to relax after a day of outdoor excitement. You haven’t seen uninhibited Arkansas beauty until you’ve stayed at the Buffalo Outdoor Center (BOC). Located in an eight-mile stretch along America’s first national river, Buffalo River, this Ozarks resort is a complete lodging and outfitting destination with both peaks and valleys – in a good way! The BOC’s 18 Mountain Top Luxury, Valley Luxury and Classic cabins are spread within the vividly scenic and quite quaint – pop. 14! – town of Ponca and the river’s national park area. 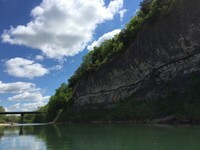 While the Buffalo River is a winding 132-mile waterway, the BOC was established near the upper part of the river where some of the best view sheds are located. Minutes away from the BOC’s main office is Steel Creek, a horseshoe-shaped bend with the river’s most stunning limestone bluff. The variously-sized cabins are one-of-a kind and are perched upon one of the Boston Mountain range’s plateaus, in the misty valley near the river’s edge or in Ponca. The resort’s largest cabin, the Riverwind Lodge, boasts an awe-inspiring 30-mile view of the upper Buffalo River wilderness. Perfect for family reunions, weddings or retreats, this Jacuzzi luxury cabin can sleep up to 24 and has an expansive dining/meeting area with floor-to-ceiling windows. The Buffalo Outdoor Center is located on Hwy. 43 in Ponca, about three hours from Little Rock. The Buffalo Outdoor Center originally started as a canoe operation. Hiking trails, canoeing, kayaking, elk watching, fishing and mountain biking. How did Remember When Cabins get its name? Well, it's really quite simple: families routinely come, have a great time, and then reminisce with each other for years to come, saying "Remember when..". That could be you! Featuring three antiquated cabins tucked snugly into three forested acres of woodland bliss, Remember When Cabins is the perfect place for you and your family/friends/partner to spend a cabin weekend. Inside your cabin you'll enjoy a screened in porch, gas fireplace, large bedroom with luxurious king-size bed, vaulted ceilings, a two person shower, separate toilet room, fully equipped kitchen, and a queen bed, from which you can relax and listen to the wonderful orchestra of crickets and frogs. Get out and sink into a bubbling hot tub or cannonball into pristine Lake DeGray. It is a cabin weekend, after all! Lake DeGray is clear, cool, and fantastic for fishing, swimming, and boating! If the word "Yurt" makes you think of an involuntary noise you make when you stub your toe, you're not alone. However, a Yurt is actually a large Mongolian tent typically used by nomads. Stone Wind Retreat doesn't have traditional Yurts, but it doesn't have a multitude of rustic Yurt-inspired cabins. The eight expertly crafted and elegantly furnished cabins are intended primarily for couples on a romantic getaway. Incredibly spacious (709 square feet) and filled with modern comforts (including log-flame gas stoves, fully furnished kitchens, and two-person showers). Outside of the cabin you have all the wonders of Arkansas at your disposal. The nearby Ozark National Forest provides an incredible venue for hiking, biking, and wildlife-watching. Slide into a hot tub with a drink and enjoy yourself- you're on vacation, after all! It's just a short 10 minute drive to Lake Fort Smith State Park. Check out the "in cabin" full body massages from one of the licensed Massage Therapists. Self-described as “The Poconos of the Ozarks”, Red Bud Valley is a model of a fantastic cabin vacation. Whether you’re bringing a big family or just escaping for a romantic weekend, Red Bud Valley will make you feel right at home. Nestled into a beautiful, garden-like 180 acre valley deep in the Ozark Arkansas Mountains, Red Bud Valley will immediately impress you with their natural opulence. As one of the most private, peaceful, relaxing spots in Northwest Arkansas, rustic relaxation is their specialty. Lay back and enjoy the sights and sounds of mother nature, from the tap-tap-tap of a woodpecker to deep orange sunsets. Both family cabins and cabins designed just for two are available, most containing wood-burning fireplaces and full kitchens. As of the 2010 census, the city population was 2,073. Wondering where Whispering Hills Cabins got their name? When you're out in the hills, awed by mother natures bounty, sometimes the wind will whistle through the trees. If you listen closely, really closely, you'll hear the hills softly saying "good choice"
Whispering Hills Cabins is located just off Highway 62 between Rogers and Eureka Springs. Boat rentals are also available at Lost Bridge Marina! Brady Mountain Resort & Marina's pristine landscape attracts visitors and guests from Little Rock to Fort Smith, and Texas to Oklahoma to Tennessee and beyond- you should be next! Nestled in the rolling hills of the Ouachita National Forest on one of the cleanest lakes in the United States, Brady Mountain is the ideal place for both romantic retreats and family getaways. Inside the resort's sizable marina you'll find a fleet of rental boats consisting of pontoon boats, ski boats, and “double decker” party barge boats equipped with water slides that are sure to deliver days of refreshing fun for both kids and adults alike. The facility also has an on water dive center, fishing guides, and a top of the line marine repair facility- and we haven't even mentioned the incredibly spacious and luxurious cabins you'll be staying in! The full-service marina features 650+ permanent wet slips which vary from 25-foot open sailboat docks to 100-foot covered slips for cruisers and houseboats. Located approximately 15 miles west of Hot Springs Arkansas, Brady Mountain Resort & Marina is a gorgeous lake oasis for vacationers, boaters, and fishing enthusiasts alike. Located in the heart of Ozark Country, Cabin Fever Resort is the perfect pick for the #15 Top Arkansas Cabin Resort. Cabin Fever Resort is located just a short distance from Beaver Lake and downtown Eureka providing the best of both worlds, city and country, for this Arkansas cabin retreat! Enjoy Beaver Lake and rent a boat to go for a cruise on the waters or cast your line! For avid fishers, there's plenty of rainbow trout in the White River. If a city vacation is more your speed, head on in to Eureka, the historical downtown area, where you can enjoy a famous ribeye at 1886 Steakhouse and a glass of wine! These cabins are great for staying in too, find the accommodations that fit your needs and fire up the grill for some good old family fun! It's all here at Cabin Fever Resort!